Dee’s mother was a spy. Or maybe a government translator. Whatever her job was, it involved sudden, unexplained absences and threatening late-night visits. Whatever her job was, she decided to reach her clidren Dee and Simon an unusual set of skills: both surveillance and evading surveillance; lying and detecting lies; self-defense, codes, and always having an escape route. Tired of her mother’s paranoia, Dee tried to live the most normal life possible: marrying Patrick and trying to be like everyone else- as unremarkable as possible. But after her mother’s death, Dee becomes suspicious of Patrick. Thanks to her mother’s training, she starts to notice little things that don’t add up. Her brother Simon seems to be no help. Is Dee just overreacting, her grief playing out in the sinister imaginings of an over-alert mind? Or is something really going on- something far worse than even she could’ve imagined? 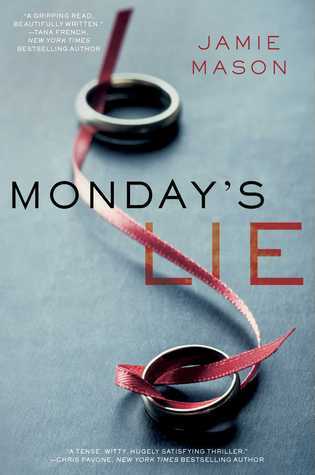 Monday’s Lie was an excellent page turner: a spy novel wrapped around a story of family, love and grieving.